If you love learning about new music, free goodies, and have some spare time then you should join the website Hit Predictor. It's completely free to join. I've been a member since 2002 and I've received a lot of free goodies like DVDs. On Friday, January 8th, Hit Predictor updated their prize store. They stocked their store with the G.I. 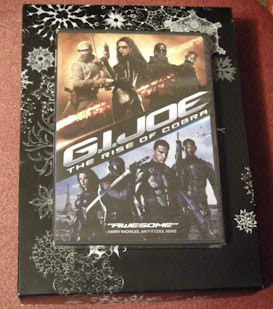 Joe The Rise of Cobra DVD. I am a HUGE Channing Tatum fan so I couldn't resist using my points on the DVD. I was very impressed at how fast my order arrived. I ordered the DVD on January 8th and it arrived on January 12th! 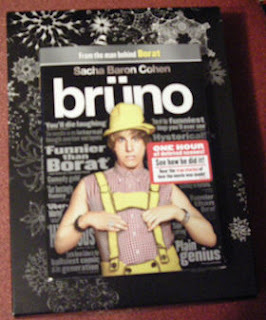 To keep up with the theme of DVDs, last week via Fedex I received the Bruno DVD that I won from Atomic Popcorn's Twitter (@AtomicPopcorn). They were giving away DVD copies of Bruno to followers who tweeted something specific. In my case, I won my DVD by having the best summary of the Twilight New Moon movie in 140 characters or less. Bella gets a papercut & causes Cullen drama. Cullen family leaves. Werewolf Jacob keeps her company but Cullen comes back.